← The 100% Waterproof Sport Car Top Carriers Are Now Available! The Auto-mo-brella is 9 ft water resistant umbrella that mounts to the hitch of your vehicle. 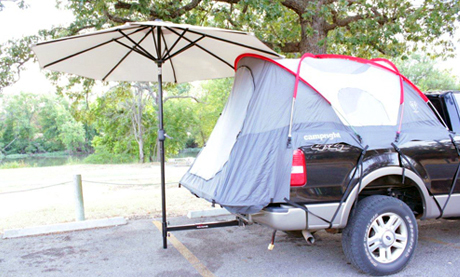 This umbrella is great for adding a little shade and rain protection to the outside of your truck tent. The pole is made of heavy-gauge steel and is powder coated for durability. It easily attaches to pickups, SUVs or cars. Anything with a 2″ receiver hitch. It even telescopes if you need a little more room between your vehicle and the umbrella. For more information visit Auto-mo-brella and to purchase visit Lakeland Gear. This entry was posted in Product Reviews and tagged automobrella, truck tent, tent for truck, hitch canopy, camping umbrella. Bookmark the permalink.